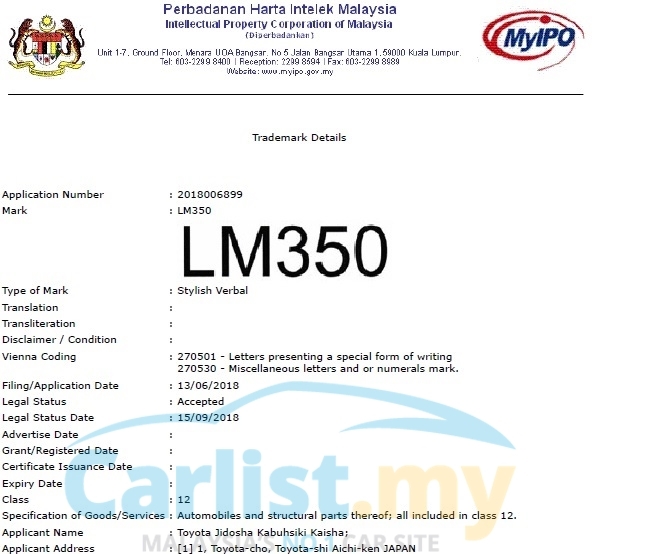 Following our recent post on the announcement by Lexus that it will be introducing a new class of vehicles – likely to be Lexus’ interpretation of the Toyota Alphard - at the coming Shanghai Auto Show, we now know that Lexus has trademarked the LM 350 and LM 300h name in Malaysia. Just as Lexus’ flagship LS sedan is short for Luxury Sedan and the LX is short for Luxury 4x4, the LM name will most likely represent Luxury Minivan (MPV). A search with the Intellectual Property Corporation of Malaysia (MyIPO) revealed that a Toyota subsidiary Toyota Jidosha Kabushiki Kaisha had registered both the LM 350 and LM 300h names with MyIPO in June last year. Not much else is known about the upcoming Lexus LM but considering that the most luxurious Toyota Alphard Royal Lounge already comes with a two-row, four-seater option, the upcoming Lexus LM will most certainly build upon that. When suitably equipped with the right Modellista accessories package, the Alphard Royal Lounge’s power-operated seats can be set to recline fully into a flat bed. It also comes with reading lights and a touch screen control panel for the rear seat entertainment system. 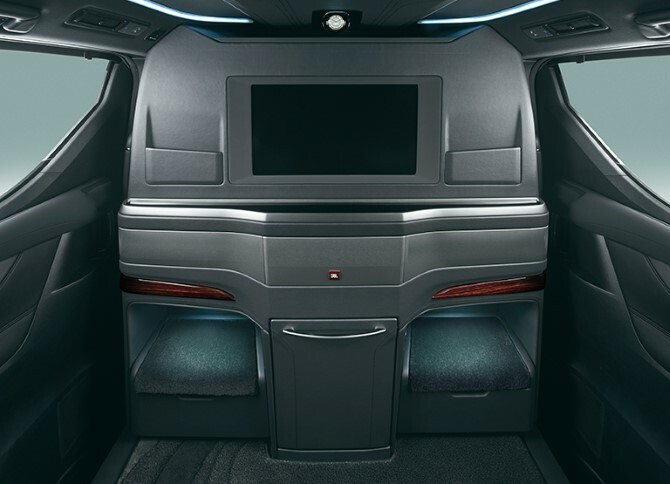 The space immediately behind the front row seats can be configured to accommodate a small refrigerator, magazine rack, and a 24-inch flat screen TV with JBL audio system. All of these are features that no Mercedes-Benz S-Class or BMW 7 Series can accommodate. The Mercedes-Benz V-Class comes close but its luxurious image is slightly muddled by its association with the workhorse Vito commercial van. 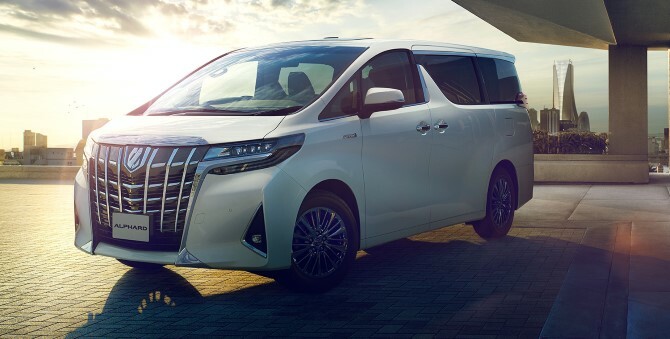 Part of the reason why the Toyota Alphard dominates in Asia is because it has no such association with a blue collar working class’ work tool like the Toyota Hiace. 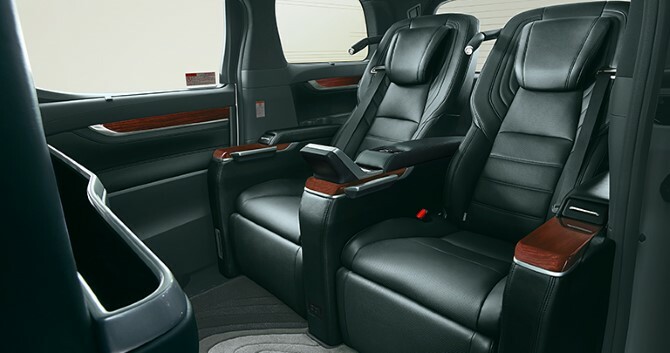 Toyota Alphard Royal Lounge with privacy screen and 24-inch TV and refrigerator option. Communication with driver is via intercom. While the four-seater Lexus LM will certainly impress, Lexus will most likely still offer a more practical 7-seater layout variant. Since the Lexus LM will use the 350 and 300h designation for Malaysia, it’s quite clear that the Malaysia-bound Lexus LM will come with either a 3.5-litre naturally aspirated V6 (LM 350) or a 2.5-litre petrol-electric hybrid (LM 300h). The question now is how far apart the Lexus LM 350 will be priced away from the Toyota Alphard, which in the same 3.5-litre V6 guise, starts from RM 443,000. The first ever Lexus LM will be making its world premiere on 16 April at the Shanghai Auto Show.